Intuitive Eating: Satisfaction vs. Fullness - What's the Difference? Eating for Fullness vs. 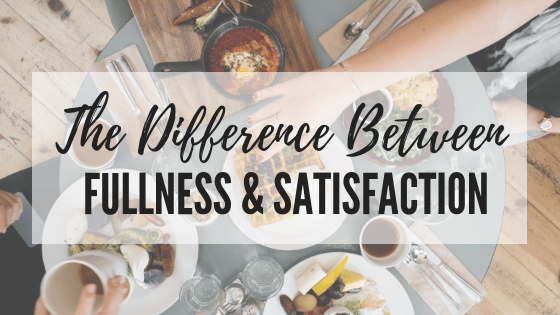 Satisfaction – What’s the Difference? A lot of attention is paid to paying attention to how full you feel, and how to stop eating when you feel that fullness. But by focusing only on fullness, we miss an important part of intuitive eating: satisfaction. 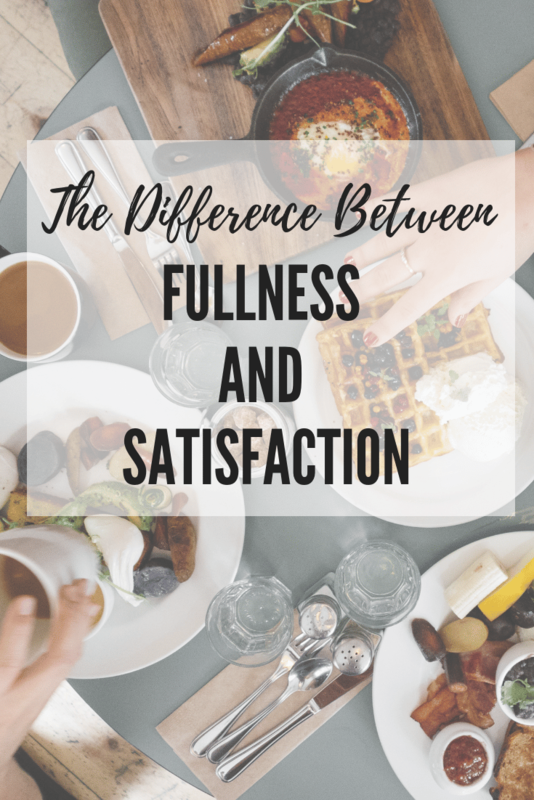 Read on for the difference between fullness vs satisfaction and why satisfaction is known as the “hub” of intuitive eating. Dieting causes us to feel like we “have” to eat at meal times – when it is allowed – so leaving food behind can be difficult. When you tune in to your feelings of fullness and satisfaction and finish a meal feeling comfortably full and satisfied, you’ll have eaten the right amount of food for your body. But do you know what comfortable fullness actually feels like? Most people can tell me exactly what it feels like to be stuffed (or “Thanksgiving full”), yet have a much harder time describing the more subtle feelings of comfortable fullness. When you are out of touch with your body’s feelings of fullness, whether from following diets or food rules that tell you how much to eat, or growing up in a household that encouraged you to “clean your plate”, it can be tough to figure out what comfortable fullness feels like. The sensation of fullness varies from person to person, so you need to figure out what it feels like in your body. One tool that can help you tune into your body’s more subtle feelings is the Hunger-Fullness Scale. 1. Minimize distractions during mealtimes. Turn off the television, power down your computer and put away your phone. Electronics distract us from our food and make it more difficult to pay attention to our fullness cues. 2. Eat mindfully. Take time to savor the food you are eating. Pay attention to how it looks, smells, feels and tastes. Eat with intention, not on autopilot. If you are eating unconsciously, it is very easy to overshoot comfortable fullness. 3. Slow down. Fullness is regulated by the hypothalamus in the brain. When your body has enough food to meet its needs, signals are sent to the hypothalamus. But it takes approximately 20 minutes for these fullness signals to be sent from the stomach to the brain. If you’re eating too fast, it is easy to eat more than you need, so aim to make your meal last at least 20 minutes. By eating when you are hungry and stopping when you are full, you will naturally eat the amount of food your body needs. This amount changes from day to day based on multiple factors, including how active you are, how much sleep you got last night, how much stress you’re under, and even what you ate the day before. leaves out a key piece of the puzzle: satisfaction. Feeling and acknowledging your fullness is important; however, fullness is not the only signal that turns off your drive to eat. If you are considering only how full you feel, chances are you’ll have a hard time stopping at comfortable fullness. This is where satisfaction comes in. If you aren’t completely satisfied with the food you are eating, it becomes much harder to stop when you are full. Physical fullness alone doesn’t turn off our drive to stop eating. Satisfaction is involved as well. That means it’s possible to feel full without feeling satisfied. Say, for example, you were to eat a large bowl of raw vegetables. Afterward, your stomach may feel physically full, but you probably would not feel satisfied. When you aren’t satisfied, you will continue to eat more food in search of that feeling of satisfaction, even if you aren’t hungry. Satisfaction is the hub of intuitive eating. If you aren’t happy or satisfied with the foods you are eating, it is easy to overeat. It’s important to find the pleasure associated with food in order to feel satisfied and content. You’ll find that the more pleasure you get from food, the easier it is to stop eating when you are full. Satisfaction is a better indicator than fullness for deciding when your body is ready to stop eating. This is why it’s important to think not only about what foods make you feel full, but what foods bring you pleasure and satisfaction as well. It may be hard to figure out what foods are most satisfying to you, especially if you’ve been dieting for a while or are used to following food rules. Diets tell you what to eat, which can make you overlook what your body actually wants to eat. But with some practice, you can figure out what foods give you the most pleasure, and it will become easier to stop eating when you are full. Follow these two steps to find that sweet spot between fullness and satisfaction. For a food to be satisfying, it needs to taste good. Make a list of foods that you enjoy eating, whether that is the taste, the texture, the smell, etc. The foods that are satisfying to you may change from day to day or even meal to meal. Before each meal, take a moment to pause and think about what food sounds good to you at that moment in time. If you’ve been dieting for awhile or are used to following food rules, this may be hard at first. Play around with it and take note of how satisfied (or unsatisfied) you feel after eating different foods. For example, one of my clients realized that hot foods at breakfast satisfy her way more than cold foods. She would be just as full if she ate a yogurt bowl, but she wouldn’t feel satisfied. Once she realized this and started eating hot meals like eggs or breakfast sandwiches, she was able to stay full and satisfied for much longer. 2. Include carbohydrate, protein and fat. These three nutrients signal fullness by releasing hunger-suppressing hormones and raising your blood sugar. While it’s possible to fill up your stomach with low calorie/high volume foods (going back to that huge bowl of vegetables), without protein, fat or carbohydrates, your body won’t feel satisfied. Can you think of some foods that fill you up, but aren’t satisfying? Share below! Want more? If you’re ready to stop dieting and want to finally heal your relationship with food – for good and at your own pace – my Intuitive Eating Crash Course is for you. When I go to dinner I feel fuller sooner because I am satisfied with what I’ve chosen to eat. Good article. Oatmeal with a scoop of peanut butter makes me feel so satisfied in the mornings. I can make it to lunch when I eat it! But toast and peanut butter leaves me wanting more. I am not sure why one is so much more satisfying to me than the other! It’s hard to know with certainty why some meals fill us up and others don’t, but it can change from day to day and meal to meal. I always try to employ curiosity instead of judgment, and see if you can think of what makes one more satisfying and filling than the other.